Highland Nature offers a bespoke Wildlife Guiding Experience to suit you and your itinerary. John Poyner is a well known Wildlife Guide based in Nethybridge, having led wildlife tours full-time for the past seventeen years to destinations ranging from Shetland to the Hebrides, as well as his "local patch" in and around the Cairngorms National Park. Knowing where the birds and wildlife are requires first class local knowledge and field craft, being accompanied by a local guide can save you time and effort on your visit, as well as peace of mind wildlife is left undisturbed and no sensitive sites are unwittingly compromised. This is a key issue particularly during the breeding season, with birding and photography ever more popular, there are sadly a growing number of disturbance incidents, often unintentional but nevertheless to the detriment of the Wildlife we all love to see. The aim of Highland Nature is to not only show you the wildlife, but help protect it and it's natural environment whilst doing so. We promote sustainable Wildlife Tourism for all and help ensure what exists in this wonderful place is kept that way for future generations. Whether you're a keen birder looking to get the Scottish Specials under your hat, or looking to just enjoy a leisurely day out bird and wildlife watching, improving your field-craft and id skills, the day is tailored to your needs. Options are fully discussed before hand, and a detailed itinerary produced for your day out. 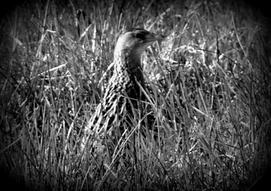 Wildlife watching requires skill, patience and dedication with field craft becoming a forgotten art by some....this is a key feature of Highland Nature.....sharing how to find and how to identify, learn calls, and how to listen and look for signs the birds and wildlife are there. ......A forest may seem silent, but stop and listen.....a cracking sound and a few spinning pine seeds drift to the ground.....Crossbills! Silently feeding hidden in the branches above your head....would you have seen them? The sudden flight of Grouse off the moor in the distance.......there's a Golden Eagle behind them, gliding low across the Heather, barely visible....would you have spotted it? Further details available by clicking below.